Good news: The Canon Summer 2012 DSLR, Lens & Flash Instant Rebate Program has now stretched deeper into the fall season. The rebates have been extended until Oct 27th. We love hearing from Photoshop users, and one fan’s story in particular really stood out when she told us about her forearm-long tattoo. Megan Orsi, now known across the web as “the girl with the Photoshop tattoo,” is a Sr. Lead Web Designer from Pittsburgh, Pennsylvania. Megan discovered her passion for arts as a sixth grader, attended the Pittsburg High School for the Creative and Performing Arts, and later graduated from college with a degree in Specialized Technology. She’s also a wife and mother to an 18-month-old son. JACKSON, Mich. – PMA, the Worldwide Community of Imaging Associations, announces The Big Photo Show, a not-to-be-missed event that will bring suppliers, retailers, labs and service providers together with consumers who are passionate about photography and videography. The inaugural event will be held from 10:00 a.m. till 6:00 p.m. on May 4-5, 2013, at the Los Angeles Convention Center, Los Angeles, California. Exhibitors will have the opportunity to present and demonstrate their products and services to the most valuable customers in the imaging industry – those whose purchases are driven by an unbridled enthusiasm for photography and videography. Attendees will get the chance to try new products, discover tips and tricks from professional photographers, improve their skills, experience the latest photo and video innovations, learn about new imaging services, find communities of like-minded enthusiasts, and even bring their own images to be framed or restored onsite. Companies interested in exhibiting or in sponsorship opportunities at The Big Photo Show can contact Jeff Frazine at jfrazine@pmai.org for more information. A shipment of the hard-to-find Nikon D800E FX DSLR is scheduled to arrive at Abe's of Maine in 2-3 days. They assured me the expected shipment exceeds their current preorders. The Canon Camera Museum just published a technical report on the new EOS M mirrorless interchangeable lens camera. B&H has the Canon EOS M available for preorder. 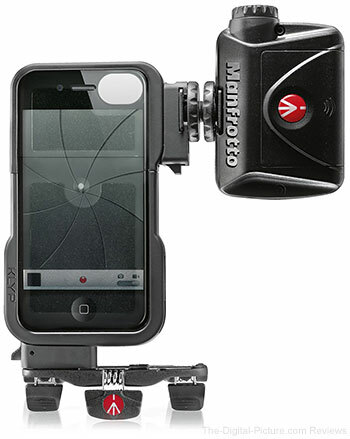 Acknowledging the market trend towards smartphones as serious image capture devices, and the huge number of videos and stills taken on the iPhone, Manfrotto, the market leader in photo and video accessories, have taken their first step into making products for those that want images from their iPhone. KLYP offers a stylish, functional method of attaching supports and additional lights to your phone, allowing you to make images, FaceTime and video capture better and easier. KLYP comes in five distinctive kits: as a case alone with two adaptor clips to enable use of your own supports and lights, one with the Manfrotto ML240 LED light for videography, Facetime and photography in low light situations and another one with the ML240 and the Manfrotto Pocket tripod for supporting the case when out and about. The more compact ML120 LED light is also available as an option in place of the ML240 in both options. The KLYP case is made of a rigid polycarbonate with a quality feel soft touch coating giving it a silky smooth appearance. The KLYP features a felt inlay to enable smooth fitting of the two parts to the phone without possibility of damage and it clips together positively. Stylish looks with the added design input of people who understand supports and lighting, KLYP is optimised to allow the attachment of a tripod and Manfrotto LED light without detracting from its appearance. By using two cleverly designed removable accessory “clips”, Manfrotto have developed the KLYP case with a patented rail system, which enables the case to remain sleek and have no protrusions to detract from its appearance. The accessory “clips” can be attached to any of four different points around the case to allow landscape and portrait images to be taken with ease, and in darker conditions, to add a Manfrotto LED light in the optimum position to fill in shadows when shooting stills or video in low light. When using the iPhone’s FaceTime feature, the continuous light can be turned 180 degrees to light the user in a soft pleasing way. Compact size, even with LED light fitted. Can be taken anywhere you would take your phone. Always with you! Just posted: Part 1 (the major part) of the Canon EF 24-70mm f/2.8 L II USM Lens Review. Join Amateur Photographer and What Digital Camera for special photography activities at Westfield London as part of the Westfield Travel Event taking place on 26-28 October. Amateur Photographer will be running Photography Masterclasses* and talks with AP Editor, Damien Demolder - demonstrating ‘seeing the shot' and ‘top tips for travel photography'. e What Digital Camera editorial team will also be on hand in the ‘What Digital Camera Clinic' answering your queries - and giving you ‘advice prescriptions' - whether it be the best camera to take away with you or the best lens to achieve the ultimate shot. The Travel event is themed across the three Sun, Snow and City zones, and will provide you with the chance to find out more information about a whole range of inspiring destinations to visit and photograph as you consider your next trip abroad or within the UK. It's the perfect event for all the family - and there's the chance to win some great holidays! *Sessions are free of charge, and are pre-bookable. To book: email apcw@ipcmedia.com stating WESTFIELD TRAVEL in the subject line. Please include Full name and a contact mobile number for the day. What Digital Camera's editorial team will be on hand to help you with all your camera and kit dilemmas before you go on holiday. How to work with the sunlight to take a great holiday photograph. Our experts will talk through images on a screen to look at ways of using different lenses in the sun, how to take great panoramic shots, action shots of kids playing on the beach and lots more! United Kingdom, September 25th 2012 - Samyang Optics is pleased to announce the latest addition to the Samyang VDSLR family, the 85mm T1.5 AS IF UMC VDSLR lens. The 85mm T1.5 AS IF UMC lens joins the four existing Samyang VDSLR lenses, the 8mm, 14mm, 24mm and 35mm. Optical construction is the same as a standard version of the 85mm lens. However this new VDSLR version is designed specifically for cinematography. As such it features focus gearing (allows control of the focus with the aid of a follow focus system) and a silent aperture ring. Product pricing, available mounts and release date will be confirmed at a later time. SAN JOSE, Calif. — Sept. 25, 2012 — Adobe Systems Incorporated (Nasdaq:ADBE) today announced Adobe® Photoshop® Elements 11 and Adobe® Premiere® Elements 11, newly designed versions of its No. 1 selling consumer photo- and video-editing software*. Photoshop Elements 11 offers a complete solution for editing, organizing and sharing photo creations while Premiere Elements 11 offers easy creation of engaging home movies with professional flair. Available as stand-alone products, Photoshop Elements 11 and Premiere Elements 11 can also be purchased together in a low-priced bundle, providing powerful, easy-to-use tools that simplify editing and turn everyday snapshots and videos into sensational photos and home movies, creating memories that can instantly be shared with friends and family. Both solutions are available for Windows® and Mac. Adobe Photoshop Elements 11 and Adobe Premiere Elements 11 software for Windows and Mac is available now at www.adobe.com, and will soon be available at retail outlets such as Amazon.com, B and H Photo and Video, Best Buy, Costco, New Egg, Office Depot and Staples. The Photoshop Elements 11 & Premiere Elements 11 bundle is available now for a suggested retail price of US$149.99, with upgrade pricing of US$119.99. Adobe Photoshop Elements 11 and Adobe Premiere Elements 11 are available individually for a suggested retail price of US$99.99, with upgrade pricing of US$79.99. Information about other language versions, as well as pricing, upgrade and support policies is available at Adobe.com. For free training videos, visit Adobe TV. Education pricing for students, faculty and staff in K-12 and higher education is available from Adobe Authorized Education Resellers and the Adobe Education Store. Visit www.adobe.com/aboutadobe/volumelicensing/education for more information about education volume licensing for higher education and K-12 institutions. B&H has the new Adobe Photoshop Elements 11 and Premiere Elements 11 available for order. Artist PJ Linden has created a one-of-a-kind Canon EOS 7D covered in candy. It may not be practical, but it looks delicious! Nikon Camera Control Pro 2.12.0 Updater is now available for download. PowerPC models are no longer supported. Reverse indicators options have been added to the General tab in the Preferences dialogue box (Camera Control Pro 2 menu > Preferences...), allowing users to reverse indicator display. When the computer entered sleep mode with a camera connected and Camera Control Pro 2 running, camera connection was sometimes not recognized when the computer recovered from sleep mode. This issue has been resolved. Biz Stone, Twitter co-founder, has partnered with Canon for “Project Imaginat10n,” encouraging consumers to submit photos to inspire a short film he will direct. Under the tutelage of two-time Academy Award® winner Ron Howard, Biz joins four other celebrity directors in this creative endeavor - Eva Longoria, Jamie Foxx, Georgina Chapman (designer and co-founder of Marchesa) and James Murphy (founder of LCD Soundsystem). Biz is now looking for inspiration for his directorial debut and will ask the public that Monday to tweet photos with a hashtag. In the meantime, consumers can submit at imagination.usa.canon.com. Biz will then review and comment on photos LIVE in public at Biz's Project Imaginat10n Tweet Station, responding with personal tweets as to what inspires him. The event will showcase how Biz is considering photos to craft the story for his film and the customized activation will also allow consumers to learn about and interact with Canon’s campaign.